First of all, a heartful thank you to Dr. Djordje Tesic, owner of Ben Ben's Kennel, breder of both Gala's parents, who kindly recommanded us to Mrs. Natasha Dinic in 1998, when she planned this litter. 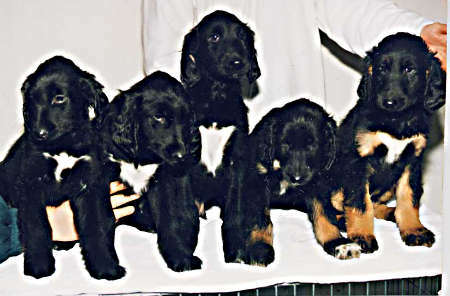 Gaudizira litter, born september 1998. From left to right: Gala, Calvaro, Cruso, Crusher and Mania. and Intl. Champion. Photo: Oct. 2001. Crusher and Mania are owned by Mr. Emilio D'Onofrio, kennel Kiss For Prince, Timisoara - RO. is loved by a wonderful family in Serbia. 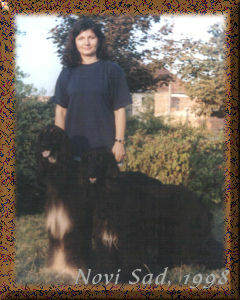 Natasha is Gala's breeder, owner of Gaudizira kennel established in Novi Sad, YU. This photo was taken in summer 1998, when she proudly presented her best and loved breeding pair, Yu CH Ben Ben's Heartbreaker (Skazy) and Ben Ben's Jazz Queen (Djina). Unfortunately, the crude senseless war in Yugoslavia has dramatically changed the life of people in Novi Sad. Natasha planned to make Skazi an Int. Ch. and her dream came true when she showed Skazi at CACIB in Timisoara (RO), May.1.1999, judge Vlastislav Vojtek, when Skazi got CACIB, BOB & BOG. She was the handler, as usual. From 1999, Skazi's new owner, Mr. Emilio D'Onofrio, continued showing him in Romania, Hungaria and Italy, where Skazi had great show career. Mr. Emilio D'Onofrio (kennel Kiss For Prince) is also proudly owning and showing two Gaudizira puppies from the latest litter: Int.Ch. "Crusher" and "Mania..."
Natasha and her husband Zoran Nikolic are now established in Canada, and all of us who love them and appreciate their work expect to get news from what will be The Gaudizira kennel - Canada. Updated on 14 Dec 2006.